Above expectations-This 3 bedroom, three bathroom house was perfect for our needs. Easy to get to/from, near really good restaurants (The Wave Cafe; Siam Imperial; Brigatine) and a well-stocked store (Market to Market) and the weekly local farmer's market. Good surf and skateboard shop nearby with a very helpful owner. The wall of windows in the main living area opens to good weather making that area almost double. It took us a while to figure outall the electronics, but once we did comfort reigned! Best Choice for Lodging-We have stayed in BB6 a couple of times. We have enjoyed it each time. The lodging is cozy and accommodating for every need. Furnishing are up to date and comfortable. Bedrooms are relaxing and spacious. Great view from the front upstairs bedroom. Appreciate the secure parking. All in all, I will use BB6 if available on my next visit. Its like home away from home. Awesome Place and Fantastic View-This place was everything I hoped it would be - the location was spectacular to watch the sunrise and sunset each day and the condo was very comfortable - we all had a fabulous day and hope to return some day!! Loved Beach Break Six!-We stayed at Beach Break Six for a girls long weekend. Location was perfect with easy access to get to where we wanted to go. The condo was new, clean, spacious, had a great view with the deck and the convenience of the restaurant/bar on the street level. The images on VRBO were exactly what it looked like! I would highly recommend this property. What an amazing place!-My family and I stayed for a long weekend and were extremely impressed by the quality of this home as well as the thoughtfulness that went into furnishing it. From the kitchen amenities to the beach towels and board games... this was definitely a home away from home. The most amazing feature was the deck. OMG! The accordion style door that completely opens to the amazing view of the pier was the highlight of our stay. The farmers market offered local food and keepsakes daily and it’s literally steps away. We will DEFINITELY be staying here again. Absolutely amazing unit. Breathtaking views. The unit has everything a family needs, plus more. The location was terrific. Easy to access any part of San Diego. Can’t wait to stay here again. Best place!-We were in San Diego with 5 teens and 2 adults for a convention for 10 days. This place went beyond our expectations. The view was beautiful and we enjoyed it every morning and evening. The condo was spotlessly clean. The beds were comfortable. The washer/dryer were a plus. The location was central to all of our activities. The 2 garage spaces were wonderful. The beach accessories were also great. We highly recommend this condo! Loved the Apartment!-Loved the Apartment! It was well equipped, clean, modern, "fresh" and with a nice balcony where we could sit and enjoy the sun-set. We also loved that the owners provided us with beach-towels and beach-hats and games for the evenings! And when we found the storage room in the garage with chairs, toys for the kids, balls, surfboards, coolers and umbrellas – all to use at the beach - we felt like pirates who had just found a big treasure! After a road-trip in California sharing hotel rooms with mon and dad for two weeks, our two boys aged 15 and 17 loved to have their own room with TV and Wifi! We really enjoyed our stay in the apartment, and would recommend it for others. BeachBreakSix-The condo was fantastic! Thank you for a wonderful week! 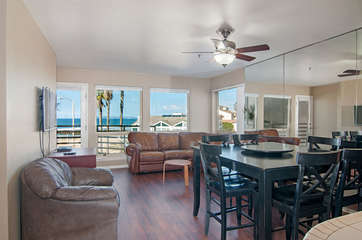 Beautiful NEW Property in Imperial Beach-We booked this property for our July 4 vacation. The property exceeded my expectations. It was nice, clean and a home away from home. It was easy to book and find. I loved the security of the entire property and garage. It was close to the beach, restaurants and grocery stores. I will definitely come again! Perfect location-Perfect location and loved everything about it. Everything was perfect!-Everything was perfect! From the time my family checked in to check out day it was great! Beautiful Property!-It was lovely property, clean and spacious for our 7 day stay in San Diego, very affordable. Awesome Stay-This was an awesome stay! Enjoyable Experience-This was our first experience staying at an airbnb. This was a totally relaxed, enjoyable experience. The condo faces the beach and the views were fantastic. The condo was more than we expected and the attached covered parking garage was a plus. Everything was within walking distance. 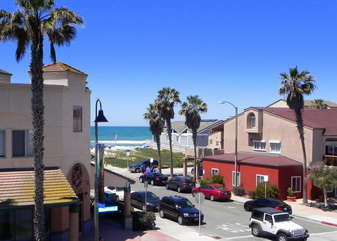 Imperial Beach is cozy and friendly, very upscale and personable. We had our whole extended family in this condo. (all 8 of us) Grandma and Grandpa did not have to climb any stairs as their bedroom with bath was on the lower level of the condo. Elevators in the building made it very easy for them to get around. 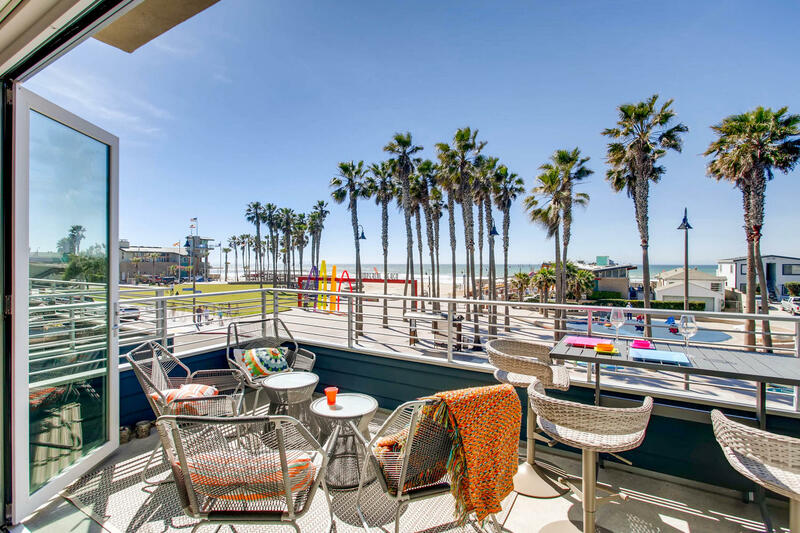 The balcony was the perfect place to enjoy a glass of wine while taking in the beach scene. The beds were comfortable, the beach was sandy and the sun was warm (even in March). I would definitely stay again. Tricia, the Host answered all my questions and was easy to get in touch with. Wow!-Wow! This condo was exactly as it was represented.....perfect! We were more than pleased with everything about it, the unit itself, the cleanliness, the location, the access to the beach, perfect! We truly hated to leave and hope it's not long before we can return! We'll be watching for some seasonal specials and airfare deals so we can schedule a return visit ASAP! Loved the Place-Loved the place, and was grateful was able to check in early. Good Location-I thought the property was in a good location. All of the condo looked just like the pictures. Beds were very comfortable. Beautiful-Beautiful condo and a wonderful location. The space lives larger than photos show, due in large part to the Sliding glass doors which open fully to the balcony. Enjoyed the property-We really enjoyed the property. The kitchen and appliances were wonderful and inviting for the whole family to be involved in food preparation. We enjoyed the long table for playing games. The layout with one bedroom downstairs and two bedrooms upstairs made it perfect for having a 3 generation vacation. The grandparents were able to stay downstairs so they didn't have to climb the stairs continually during our stay. The views were amazing and ease of beach access was wonderful! The beach was good for sandcastle building and the waves were good for seasoned boogie boarders. We would definitely stay here again! Wonderful vacation.-We had a wonderful vacation. The property was beautiful. We had 7 people and it accommodate us all perfectly. We cannot wait to return! Great New Place-Great place right across the street from the beach. Nice parking in secured garage. Modern, clean, and reasonably quiet. Management company's emails leading up to the stay were perfect and informative. It was fantastic!! !-I love using this company. They have amazing properties! Awesome Home-When first walked into this new condo we immediately felt vacation mode . Lovely furnished with amazing ocean views. . This spacious space made it easy to relax while the kids were downstairs playing board games( supplied in the unit). We had our breakfast out on the baloney over looking the ocean and our sunset dinner on the same baloney. ( which we picked up delicious organic goodies from the farmers market which takes place right near condo It doesn't get any better then this!! Fully stocked unit with good coffee maker, comfy beds, great pillows, tvs in all the bedrooms and in living room and beach stuff. Easy parking in secured garage. Good local restaurants. Loved that their was an organic breakfast/lunch place across the street. We already booked again for a week in the summer. Amazing Vacation in Beautiful Property-Two weeks ago my husband and I were guests at Beach Break Six. We fell in love with this place right from the street. You have a great common area which can be used for parties if you want to stay outside and just snack/eat. And then came the lovely interior. One gorgeous sight after another. The living room has the floor to ceiling fold out doors which made you feel you were almost right on the beach. You could look out/ lounge on the lovely furnished terrace and just breathe in that great air and feast your eyes on that ocean. You won't want to leave. It was completely furnished very tastefully. Everything you could think of. Decorations/furniture fit the beach theme and the colors were perfect. The owner chose the right size furniture to show off the gorgeous well sized rooms - the accent pieces were very pretty and functional - just a lot of cheeriness and airiness. You had plenty of room to wander and the 3 bedrooms plus 3 baths plus BIG closets were roomy enough for any group. The kitchen was so cheery and I loved the draws that closed by themselves. And what could be better than your own washer/dryer and 4 flat screen tv's. We did not want to leave !! !